October college football is upon us, which means we’re less than a month away from knowing how the College Football Playoff Committee has the top teams in the nation ranked. For now, let’s get ready to discuss some pretty interesting football games ahead of us this weekend. Here are my picks for the most interesting games in the NCAA football landscape! It’s “Red River Showdown” week! Texas has won four straight led by head coach Tom Herman and a stout defense will be looking to beat the Lincoln Riley’s Sooners on the road. 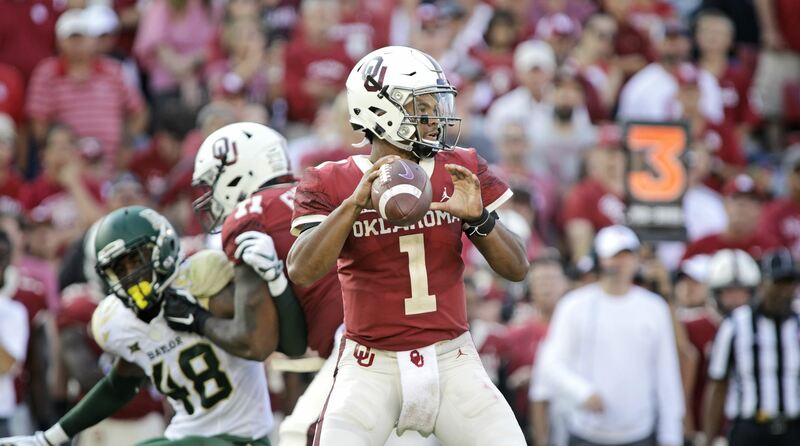 Despite some very impressive defensive performances by the Longhorns, facing Heisman candidate Kyler Murray will prove to be a complicated task. Although they struggled against Army, Oklahoma has a lot of talent on offense and coming off from a 66-33 win against the Baylor Bears. As much as I like what the Longhorns are doing, I can’t see how they stop this Sooners team on Saturday. Florida has made its way into the top 25 after defeating Tennessee and Mississippi State and will host a very strong LSU team in the Swamp this Saturday. With 14 takeaways under their belt, the Gators’ defense is no joke at all. For LSU, Joe Burrow has stepped up at QB as he has led his football team to five consecutive wins. The narrative for the Tigers has been how the offense is beginning to wake up, but don’t forget about that pretty impressive defense. Playing on the road will not help the Tigers, but I expect them to win a close, low-scoring game against a very scary SEC rival. The Notre Dame Fighting Irish are still undefeated after hosting Stanford last week. It’s a very promising team, and with Ian Book taking the snaps at QB, the Fighting Irish should be confident about facing the Hokies this weekend. Head coach Justin Fuente has been an amazing hire for Virginia Tech and he’s the person who should have Notre Dame concerned. That and the epic entrance that this team pulls off as “Enter Sandman” rocks the entire stadium. However, I have Notre Dame winning this game comfortably. This is quietly one of the best games of the week. Kentucky is ranked in the top 15, they are undefeated and aiming to have their best start since 1950. Even still, the unranked Texas A&M Aggies are the favorites by 5.5 points. Kentucky counts with a top running back in Benny Smell Jr. The Aggies will limit the Wildcats running game with one of the best defenses in the country. On offense, dual-threat QB Kellen Mond is the guy to watch for the home team. I expect this one to be a dramatic game. I’m going with Kentucky. It’s a special team, with a strong offense and defense and it won’t be easy to bring them down as they try to open their season 6-0.